However, its shares fell 3.5 percent in early Thursday trading, as traders expressed some disappointment about margins. At Wednesday's close, the stock was up 7.4 percent year-to-date. Europe's most valuable tech company is ramping up sales and installations of its cloud-based S/4HANA business suite, which is superseding its mainstay Business Suite enterprise software that is sold under license and runs at on-site servers. "The future has never been brighter at SAP - we're fired up and ready to go," CEO Bill McDermott told journalists on a conference call, highlighting a full fourth-quarter order book. McDermott claimed the mantle for SAP, which competes with Salesforce and Oracle, as the world's No.1 cloud enterprise software company by users - it has 170 million - and said it was also the fastest-growing in the cloud. In a survey this week, just 10 percent of respondents in SAP's home market of Germany said they were willing to make that change. The national DSAG user group urged the company not to retire the Business Suite as planned in 2025, but instead to continue a hybrid offering of cloud and on-site services. "Cloud doesn't always mean process simplification - it can also be a straitjacket," said DSAG board member Marko Lenck. McDermott said the cloud was "where the customer wants us to go" while also playing up SAP's push into Customer Relationship Management (CRM) with its recently announced C/4HANA suite. "We are going to take over the CRM market, not because we are bold and innovative, but because the customers want the best end-to-end service," he said. 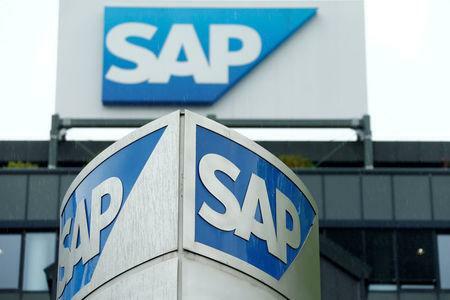 SAP's third-quarter non-IFRS revenues grew by 10 percent at constant currencies, ahead of market expectations. Non-IFRS operating profit growth of 11 percent was less than expected. At the bottom line, earnings per share of 1.14 euros beat the mean view in a Reuters poll of analysts.